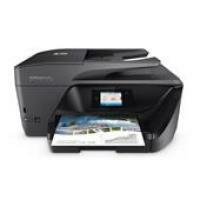 HP OfficeJet Pro 6971 is a feature-packed all-in-one printer that is suitable for any home or small office environment. The printer is black in colour and its design add a real class to printing when placed in any workspace. It has built-in Wi-Fi connectivity which makes it extremely simple to print using a smart device. With the support for Google Cloud Print, one can find it more convenient to print the documents sitting at any corner. On the way to save both time and money, the OfficeJet Pro 6971 printer supports automatic duplexer. It also uses XL size HP OfficeJet Pro 6971 ink cartridges so that you do not have to worry about frequent replacing of the ink cartridges. With the maximum printing capabilities, the printer lacks in providing fax support and is relatively slow to use for any business purpose. The printer is highly durable in nature and makes printing more efficient and reliable. With the Wi-Fi connectivity, one can easily print the documents using the compatible wireless device and does not require a network connection. If we overlook the speed for printing documents, this device is a great choice for users who love to print photographs as it is efficient in printing good quality photo prints in less time. What should be done if the printer gives inconsistent output while printing? To resolve this issue, clean the ink cartridges with the recommended items to get a clear print quality. Follow the steps given below to clean the cartridges. Gather the following items before cleaning the HP OfficeJet Pro 6971 ink cartridges. Use clean, distilled water. Bottled or filtered water can also be used if distilled water is not available. Use a clean cotton bud or a soft lint-free material. Press on the power button to turn on the printer. Open the cartridge access door. Be careful while opening the carriage, it moves to the right side of the printer. Push down at the top of the HP OfficeJet Pro 6971 ink cartridge to release it from the printer, and then pull it towards you to remove it from its slot. Inspect the ink cartridge for ink and detritus buildup. Dip a clean cotton bud or lint-free cloth into distilled water, and then squeeze any excess water from it. Gently clean the copper-coloured contacts. Lightly moisten another cotton bud with distilled water, and then squeeze any excess water from the swab. Use this bud to clean the electrical contacts in the carriage, located inside the printer on the carriage slots. Wait for ten minutes to allow the cartridge and carriage electrical contacts to dry. Slightly slide the HP OfficeJet Pro 6971 ink cartridges into the empty carriage slot, and then gently push at the upper part of it until it fixes into place. Make sure the tricolour cartridge goes into left carriage slot and black cartridge goes into right carriage slot. Close the access door. Reconnect the power cables, turn on the power button and try to print again. If still, the output is not consistent repeat the above steps. Q. What are the paper specifications of HP OfficeJet Pro 6971 All-in-One printers? Q. I recently ordered a pack of compatible HP OfficeJet Pro 6971 ink cartridges from your website, but my printer got spoilt and I no longer require the ink cartridges. I have not opened the packaging. Is it possible for me to return the ink cartridges? A. We accept the return of non-faulty orders that are up to 30 days old. Please contact us within 30 days from receiving your product to return the non-faulty item. We will refund the amount back to you as soon as the item is checked and deemed fit for resale. Please note that return of non-faulty items are subject to a 10% restocking fee. Q. What is the monthly duty cycle of HP OfficeJet Pro 6971 printer? A. HP OfficeJet Pro 6971 All-in-One printers can handle up to 20,000 pages per month. Q. Can your compatible HP OfficeJet Pro 6971 ink cartridges invalidate my printer’s warranty? A. No, using compatible ink cartridges with your printer will not invalidate its warranty. However, HP printers do not cover damage caused due to compatible ink cartridges. You do not need to worry about any damage or problem caused to your printer due to our compatible ink cartridges, as they are tested under ISO standards to work well with your printer. Q. I am a photographer and require ink supplies regularly. However, buying original HP OfficeJet Pro 6971 ink cartridges has become very expensive for me. I want to reduce my costs, but I do not want to compromise on the printing quality. What should I do? A. Our compatible ink cartridges are the perfect choice for you! All our ink cartridges are factory tested and certified to work smoothly with your printer. We also use premium quality ink in our compatible cartridges, so that the user does not have to compromise on print quality.